"Skiers and snowboarders make their way down the terrain park at the Utah Olympic Park in Park City, Thursday, Feb. 4, 2010." I forgot to post this from February. 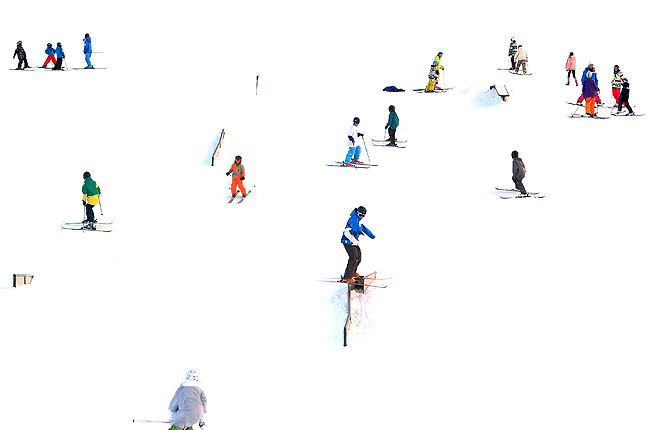 Between shooting portraits of winter Olympians at Utah Olympic Park in Park City, I found myself pointing my lens out the window at skiers and snowboarders as they made their way down the terrain park. I could never really jump on skis, so I am always amazed watching people in the "jib park." This is also an extension of my blown out snow project I've been trying to work on despite the quickly approaching warm weather.